Ecuador: Fr. Dehon’s first mission | Walk with us! Fr. Stephen Huffstetter, general councilor, writes from Ecuador where he has been visiting with our SCJ community there for the past week. Fr. Dehon sent the congregation’s first missionaries to Ecuador in 1888. But due to several complex problems the mission did not succeed and the SCJs left the country in 1896. One hundred years later the Spanish Province took up the mission anew. The district now consists of two communities in Quito and one on the coast at Bahía de Caráquez. District members come not only from Spain, but also from Venezuela, Brazil and now Ecuador itself. I arrived in Quito late at night for my first visit to Ecuador. Driving to the community house I could see lights up and down steep mountainous hills, but couldn’t get a true perspective on the landscape until the morning sun. Fr. José Luis Domínguez González, the district superior, and Deacon Carlos Alonzo Vargas led a walking tour of the neighborhood. With an altitude of between 9,000-10,000 feet above sea level, I appreciated the slow pace as I gasped for breath climbing the hills in the thin altitude. José Luis joined the Ecuadorian mission in 2001, one week after his priestly ordination, and is finishing his first three-year term as district superior. He has been highly involved in Retrovaille, a program for marriages in conflict, and served as president of the Latin American chapter. Carlos is from Venezuela and has served the district in the Bahía de Caráquez region since March. I also met Fr. Edson Pacheco de Almeida, a Brazilian working in Bahía in pastoral vocational ministry, and Hernan Carrera Pruna, an SCJ candidate from Ecuador doing his philosophy studies. Our district / formation house is in a neighborhood next to the Central University of Ecuador. A good number of students were in summer sessions as we walked through campus. Nearby are the Catholic Episcopal and Religious Conferences of Ecuador, as well as the Catholic University where SCJ candidates attend classes. In September, there will be one returning and six new candidates in formation. 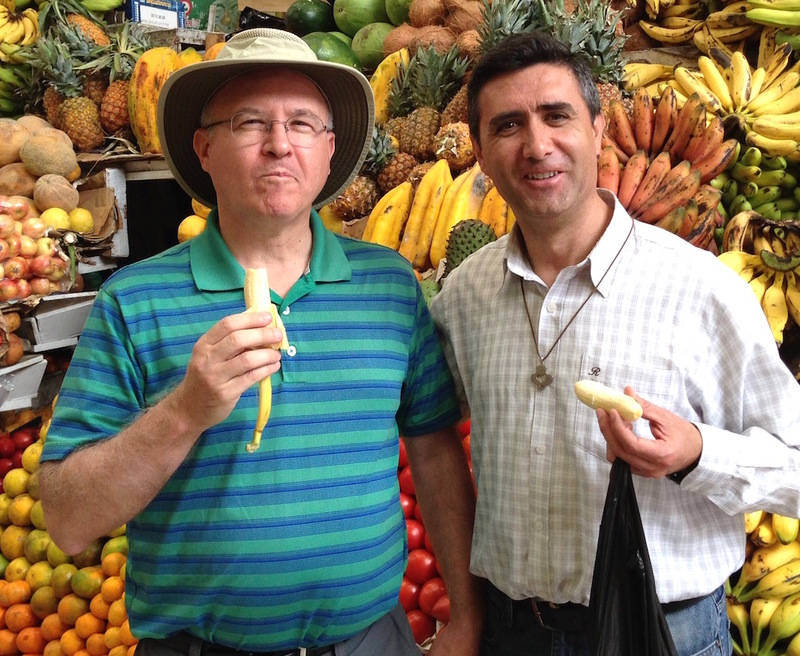 Our first stop was a marketplace where I saw many fruits and vegetables new to me. Jose Luis helped me to learn the new vocabulary of what we saw, and then we snacked on luscious bananas and salted, roasted corn kernels. We saw a great variety of fish, popular in this coastal country. Our parish in Quito, Santa María de la Argelia, is actually a series of nine chapels that serves a large area of the southern section of the capital. The area houses around 50,000 people. 90% of the country is nominally Catholic, and as is true in most parts of the world, the challenge is to serve the smaller percentage we see in church each week and reach out to those who are on the periphery. This area of Quito has grown as people from smaller countryside villages flock into the cities in search of work. Fr. Artemio López Merino and Brother José María Urbina Rioja are two of the original missionaries who re-founded the congregation’s presence in 1997. Artemio gave me a book he wrote on the history of the mission. Fr. 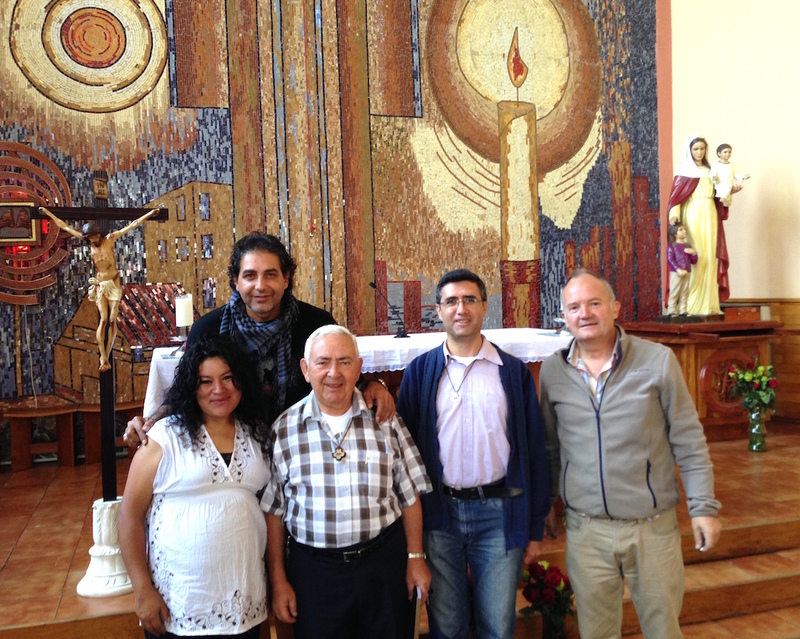 Benjamín Ramos Fraile, who spent many years in Bahía and was just named pastor in Quito a month ago, joins them. He is organizing a week-long summer church camp for youth aged 4–13 and is getting to know families along the way. Fr. Joaquín Izurzu Satrústegui is a member of the Spanish Province and is helping for a month while on a break from his school ministry. 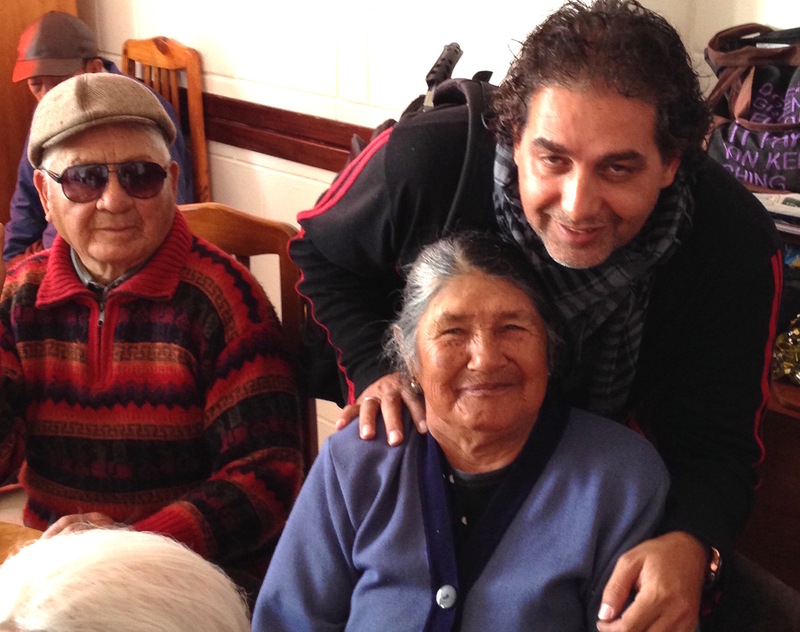 The SCJs sponsor a parish program for the elderly in collaboration with the local government. The elders refer to themselves as “70 + a little.” Services include meals, physical therapy, nutrition counseling, regular medical check-ups, and a social worker available to help address family issues. Perhaps most importantly is the social dimension of time spent with others in fun activities. We celebrated Mass to help with the spiritual dimension of their life. Their spoken prayer intentions included so many heartfelt prayers for the needs of not only of their own families, but of the community around them. I was surprised at the strong bear hugs the little old ladies embraced me with after Mass. Life in these barrios can be difficult, with family violence, many absent fathers, gang activity, drug dealing, and a shortage of good jobs. The parish secretary’s office installed metal grating after a couple of attempted robberies. Friday evenings the parish has an outreach to the homeless, as they go into the streets to meet people in need. The chapels range from mid-sized churches to community meeting rooms. We visited three. Next to the San Francisco Javier chapel are 11 small houses, originally built to house domestic violence victims. Now the community uses them to host refugees, many from neighboring Columbia. The community of San Carlos is building a new chapel, a few bricks at a time, as they are able. One temptation is to seek outside money and finish more quickly. Though it will take longer for the parishioners to build it themselves, in the end it will have ownership and responsibility. At Argelia Alta, several women and children of the parish welcomed our tour. While many parishes I am familiar with have individuals who are daily communicants, the weekday Mass traditions here are different. The evening parish Mass is attended by various parish groups. One night we celebrated with the family outreach committee. The second night was the charismatic prayer group. Each group is responsible for the liturgical ministry that day, like the music, readings and serving. One night I sat in on a gathering of parishioners who have benefited from a Spain-based micro-credit program to help families start small businesses. Mr. José Luis Angel Vega met with groups of 6-10 people with team names like “Sacred Heart” “Santa María,” and “Life and Faith” They stood and introduced themselves and their business which included carpentry, a tire shop, restaurants, clothing stores, an internet café, and raising both pigs and puppies. They receive small loans of up to $1,000 and the group helps people work together to make sure that the business becomes stable and the loan fund is repaid so monies for other possibilities can be reinvested in the community. It is difficult for people who have ideas and hopes but no collateral or resources and this gives them a chance. These people are now providing needed and wanted services for their neighborhood, all within the parish. I spent time talking to each individual in the district, and with the local communities as a whole. What they want the congregation to know is that they work hard both pastorally and to form a living situation good for religious life. They have formed an international community, and while they strive to develop local vocations among the Ecuadorian people, they also want to welcome those from other entities who have a good spirit of mission to join them. I had a fun day exploring the touristic side of Quito. 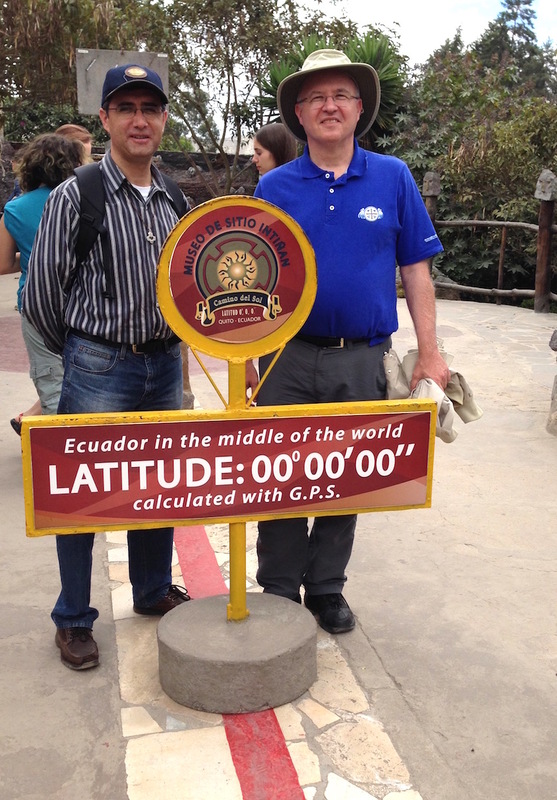 Ecuador is obviously located on the equator. Mitad del Mundo, (middle of the world), is a monument and village built on the site first calculated to be earth’s geographic center. We toured a village of reconstructed typical native houses in diverse regions such as the Amazon, the mountain highlands and coastal plains. Our guides were dressed in colorful local folk attire and brought the lives of the region’s first inhabitants to life. At the GPS equatorial line we entered a museum which demonstrated the forces of gravity, and how just a few feet on either side of the equator water swirls down the drain in different directions, but straight down when in the geographic middle. I tried to balance an egg upright, but couldn’t master the intricacies. A tour group of US high school students was starting a tour in English, so I joined that group to learn about the flora and fauna and people of Ecuador. We also saw some actual shrunken heads. Some were taken to show power over the enemy, others to preserve the wisdom of a respected elder in the community. The practice is now banned, but in some remote regions it continues. The mountainous volcanic land around Quito is quite striking. 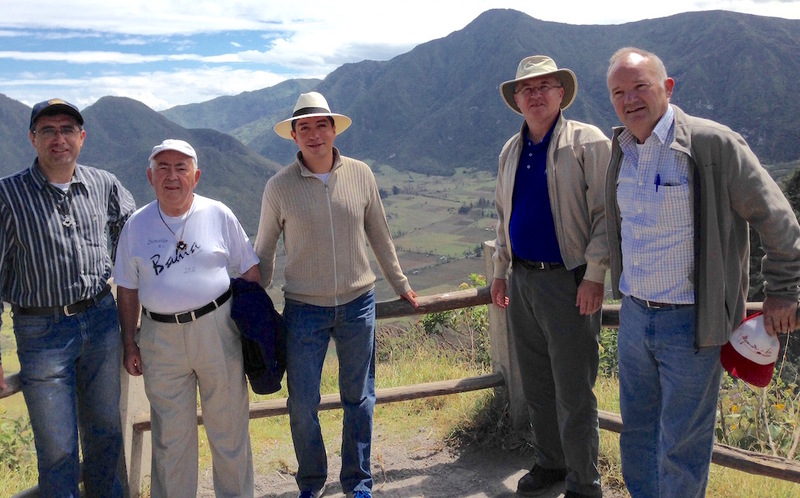 We stood above a huge volcanic crater, Pululahua, perhaps 25 miles in circumference. In the valley far below we could see green and fertile farms. We also hiked up El Pucará de Rumicucho, a hilly area used by the Inca and older tribal cultures for prayer and ceremony. While I have tried many new fruits and foods, the national dish Cuy, (Guinea Pig) has been the most unique for me so far. Our group split a platter, and the meat was tasty, like moist and tender pork ribs.